The 0729-1758-99 single-axis tilt switch utilizes a Fredericks TrueTILT™ wide-range electrolytic tilt sensor and two open collectors, one for each direction, with user-settable trip points for a repeatable and reliable output. Its robust plastic housing provides excellent durability and environmental protection. This tilt switch has superior tolerances and unit-to-unit performance. Its low-profile housing and economic design make it an ideal solution for a versatile range of applications in all sectors. 0729-1736-99 dual axis tilt switch – This dual axis tilt switch utilizes a Fredericks TrueTILT™ wide-range electrolytic tilt sensor and relay with user-settable trip points for a repeatable and reliable output. A variety of user-settable features are accessible through RS-232 communications, making it easy to change settings in the field. Its robust plastic housing and epoxy potting provide excellent durability and environmental protection. This tilt switch has superior tolerances and unit-to-unit performance. Its low-profile housing and economic design make it an ideal solution for a versatile range of applications in all sectors. 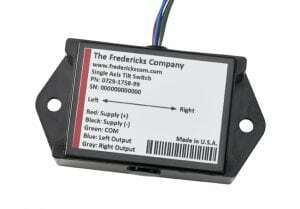 0729 series inclinometers – These inclinometers utilize Fredericks TrueTilt™ wide range electrolytic tilt sensors. They have a variety of outputs including analog, RS -232, and RS-485. These inclinometers have a low profile and a robust plastic housing with epoxy potting to provide excellent durability and environmental protection. 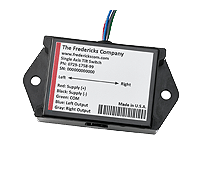 6200 series signal conditioners – These PCB signal conditioners can be configured with any Fredericks electrolytic tilt sensor. They have a variety of outputs including analog, PWM, RS-232, RS-485 and SPI. The electrolytic tilt sensor and signal conditioner are provided separately or as an assembly with the sensor already installed at the customer’s request.